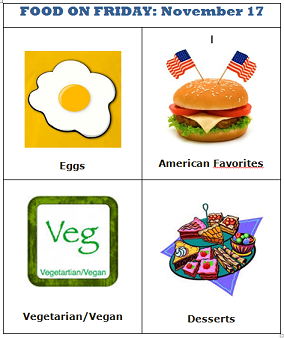 As you can see, there are 4 new themes – Eggs, American Favorites, Vegetarian & Vegan and Desserts. I have deleted the Pot Luck Category – it wasn't getting much love. While you can still link up at any time during the month, can I ask that you put one or two dishes for each category in right away. This should result in a good number of dishes for us all to explore. Let's make November a vintage month for Food on Friday. I brought you three vegetarian dishes. The moussaka is labor intensive but delicious! Brought something for each category. I really enjoy your parties, thanks so much for including me! Cheers! I just linked up some desserts, feeling fatter with every post I read and now my sweet tooth is acting up! Carole, my hazelnut roulade is naturally gluten-free, so one most everyone can enjoy. Just to mention an idea given to me by Jean - if you mark my email as Keep as New it'll stay in your inbox as a reminder to add to the collection during the month. Thanks Carole. I hope I added my No Bake Pumpkin Cheesecake correctly! Thanks for the invite, Carole! I added my layered maple cheesecake, but only put my name in the Your Name box and not the title of the recipe. I might have entered it twice. Sorry. Thanks for the invite :) Linked my Kharzi recipe, Arunachal Pradesh Cuisine for the event but entered my name instead of recipe name. Please help to change it. Linked to my recipe for chai masala, the Indian way. I entered my blog name instead of the recipe name, though - is there any way I could change that? Looking forward to trying November's recipes! Been awhile since I've been here. I added a few dishes. A couple of cakes, a vegetarian, my award winning crab cake recipe and a lovely spicy deviled egg recipe. Linked my recipe for a holiday desert favorite Kugel! Carole, my Make-Ahead Turkey Gravy and Broth fits the American Favorites category, especially this week!